Applied Industrial Technologies can help lower your procurement costs and make ordering easy through our OMNIA Partners cooperative purchasing agreement. Take advantage of OMNIA Partners pricing on a wide range of maintenance supplies and services from Applied. With over 90 years of experience and more than 6 million parts, we've helped thousands of customers find the right products & solutions, reduce their inventory costs and satisfy their customers. We would like to do the same for you. Our pricing offering was determined through competitive solicitation by Maricopa County, Arizona. The contract pricing structure represents significant discounts, ranging from 25% to over 50% and covers one of the most robust industrial MRO product offerings available. This represents over 2,000 world class manufacturers, 6 million line items and related services. For our detailed pricing information please contact us at uscommunites@applied.com or call Applied Industrial Technologies at 1-877-279-2799 for more information. You can control costs while improving performance and efficiencies with facilities maintenance solutions and services from Applied Industrial Technologies. Applied® works closely with you to assess your application needs and select the MRO product solutions and services to help you meet your goals. Count on Applied for bearings, power transmission, material conveyance, hydraulic and pneumatic components, hose & fittings, and rubber products from trusted suppliers. You will also receive competitive pricing on a full line of services, including MaintenancePRO® technical training, rubber & hose shop services, repair and rebuild services. Whether you run a Public Works, Facilities Maintenance or Civil Engineering department, Applied offers the supplies you to maximum efficiency. Here are just a few of the products we can provide to the shops listed. We also offer vending solutions that bring control and cost savings to your distributed inventory so that you know where your assets and consumables are at all times. Whether you run the Admissions Office, Maintenance Shop, Fleet Department or you are a professor working at a college, Applied provides the industrial and maintenance supplies you need to keep your school in A+ condition. Here are just a few of the products we can provide to the locations listed. We have experience working with State Departments of Transportation, City Transit Departments, Bus Terminals & Service Facilities. Our trained associates understand your processes and products. Applied Industrial Technologies also offers 24-hour emergency support, part sourcing and OEM conversion, cost savings and lead-time reduction for our Auto & Fleet customers. From a single bearing to a hydraulic system, you can count on Applied to have what you need, when you need it. With our high-quality, brand name industrial supplies, you be sure we have the products you need to run your wastewater or water treatment facility. Here are just a few of the products we can provide to your operations. 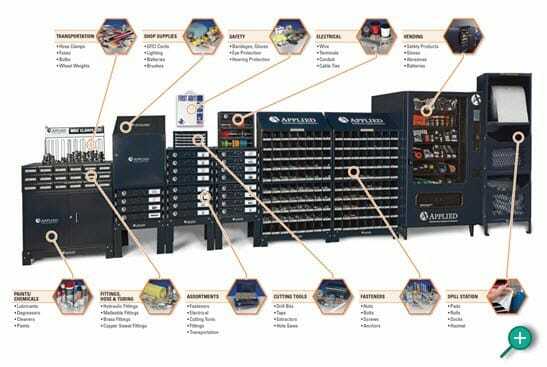 Our vending solutions bring control to your distributed inventory so you know where your assets and consumables are at all times. Managing inventory with Applied Maintenance Supplies & Solutions® systems reduces MRO supply costs and time spent searching for supplies by securing distributed inventory and offering accountability for misplaced assets. 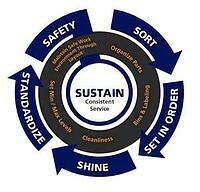 Applied MSSSM delivers solutions to manage the most critical assets and commonly used MRO supplies. The 6-S System allows Applied Maintenance Supplies & Solutions® to manage MRO inventory to customer specifications. 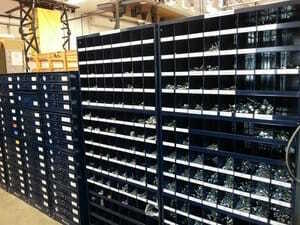 Using Lean Principles keeps your small parts inventory organized and in stock, using state-of-the-art technology. Visit: Stop by one of our Applied Service Center locations. Click here to locate your local Applied Service Center. Where is my nearest Applied service center location? To locate your closest Applied Service Center, please click here. Can I purchase Applied products online? Yes. Our website, Applied.com, provides 24/7 access to more than 2.5 million products from over 2,000 manufacturers. Does Applied offer after-hours emergency support? Whether you need a product at 10:00 a.m. or 10:00 p.m., Applied is nearby and there when you need us. Each Applied service center provides 24-hour emergency service seven days a week. What is covered under the Applied-OMNIA Partners contract? Our contract includes competitive pricing on thousands of industrial MRO supplies such as bearings, power transmission, material conveyance, hydraulic and pneumatic components, hose & fittings, and rubber products. In addition, we feature more than 2.5 million products available on our website www.applied.com and our most popular products are featured in our Applied Product Catalog. We also offer competitive pricing on our full line of services including MaintenancePro® technical training, rubber & hose shop services, repair and rebuild services and vending solutions. If my agency already has an account with Applied, do I need to set up a new account? No. Contact your Applied Account Manager or call 1-877-279-2799 to have the OMNIA Partners program linked to your existing account. Yes. As an OMNIA Partners participant and Applied customer, your agency will receive competitively solicited pricing on any size order (contract #:16154). There are no costs, minimum quantity requirements or spend limits associated with using the Applied OMNIA Partners program. The key value for the agency is resource savings. On average, OMNIA Partners participating agencies will receive significant savings over traditional procurement practices. Most agencies today are spread too thin. Agencies are downsizing administrative departments, and retiring or departing purchasing and maintenance positions are left unfilled. The OMNIA Partners program provides a mechanism to save the time and costs associated with obtaining quotes or preparing bids. The time savings allow the department to accomplish its work tasks more efficiently with the personnel on hand.